The Princess of Rhythm and Praise is back! Lisa McClendon has returned with a new project, outlook on life, and an indomitable spirit to praise God no matter what. Gospelflava.com had the pleasure of catching up with the gospel neo-soul songstress to talk about her new release, new lease on life and what’s new outside of music. Since McClendon’s skies are all cleared up, she’s been a busy woman! She adds the title of author to her brand. “The Proverbial Girl” a 31-Day Devotional, is a funny, inspirational and challenging story guide for girls, like her daughter Diamond. Its goal is to educate them how to carry themselves through the guise of the scriptural passage Proverbs 31. You will soon be able to hear more of McClendon on the radio, but not just singing. She and her husband are joining forces to host a radio show this year. “I’m excited to be working with him!” she exclaimed. 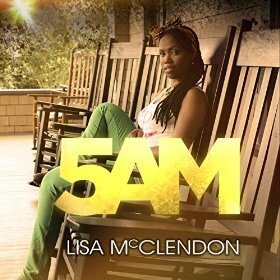 After a listen to “5 AM” you can clearly detect that McClendon’s skies are no longer gray but blue, sky blue. In our chat she repurposes a line from the Clark Sisters’ song, “My sky is light blue, because sky’s the limit to what I can have.” The mantra that knits this project together is McClendon’s heart. Each track is a lyrical personification of her heartbeat with God’s love permitting each pulse. Welcome back Lisa! This entry was posted on Friday, February 20th, 2015 at 2:53 pm	and is filed under Album Releases, Audio, Uncategorized. You can follow any responses to this entry through the RSS 2.0 feed. You can leave a response, or trackback from your own site.